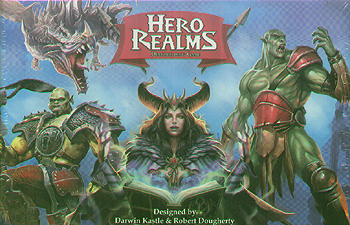 From the makers of the award-winning Star Realms Deck building Game, Hero Realms combines the fun of deck building games with the interactivity of trading card game-style combat. As you play, use gold to add new actions and champions to your deck. When played, those actions and champions generate powerful effects, give you additional gold, and damage your opponent and their champions. If you reduce your opponent's health to zero, you win! This deck is a complete game for 2-4 players, and contains rules and 144 cards. To expand the game for more players, use an additional deck or add on Hero Realms Character Packs.